Apart from Minnesota and the Jimmy Butler’s drama, the teams of the Northwest Division bet on consistency with small additions to already solid rosters. OKC had the best summer thanks to George’s re-signing. Utah showed the most promises thanks to Mitchell’s explosion while Portland and Denver will at least try to get a playoffs spot. The battle of the West is launched. By re-signing PG13 for the next four years, the Thunder stays in contention for the crown in a crowded Western Conference. It also finally get rid of Melo and has won an interesting piece with Schröder, who will lead the team during Westbrook’s injury. In the backcourt, Roberson will be in competition with the fast improving Ferguson and rookie Hamidou Diallo, another athletic freak. Nerlens Noel is another athletic defensive player who will bring depth to the Thunder’s frontcourt. 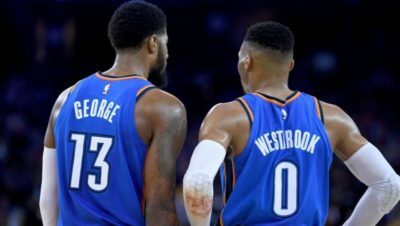 OKC may lack some outside shooting but it has improved its depth and given the key to George and Westbrook to take their responsability. Stability is the key for the Jazz who recorded the steal of the 2018 draft with Donovan Mitchell. He’s the offensive leader of this team while Gobert is asked to protect the rim, something he’s done efficiently. With Ingles, Rubio or Crowder, the team has plenty of glue guys whose only goal is to make the team win games. Rookie Grayson Allen has been surprisingly good and will add shooting to a pretty inconsistent backcourt while Utah still hopes Dante Exum can be the all-around guard he was supposed to be when he was drafted. The team may lack a shooting PF but the roster is solid enough to dream of Conference finals. Another pretty stable roster, the Nuggets have lost Chandler, Faried and Arthur but has maintained a solid core of starters. Despite the competition, Murray has proved he was worth the starting spot, where will form a solid backcourt with Gary Harris. Inside, Jokic will be the focus point of the offense while Millsap will be the tough minded PF he’s always been. Denver is a bit short on the wing and will probably need to start Will Barton, who is better suited for the sixth man role he had. Maybe that will change if rookie Michael Porter finally gets healthy and justify his high school fame? One or two more solid reserve players would not be unuseful as Denver can really count on only three players from the bench. Playoffs is the goal, more would be a huge bonus. The backcourt of Lillard and McCollum is back again for a team that has disappointed in the playoffs against a solid Pelicans squad. The staff tried to add more shooting from outside with Seth Curry and rookies Anfernee Simons and Gary Trent. The team has always plenty of solid role players but in a loaded Western Conference, the Blazers needs a third man to step up. Now than solid rebounder Ed Davis is gone, Collins and Swanigan will be asked to show what they got. The Butler’s drama has started for almost a month and is not over yet. Everytime a team offers a package, Thibs is asking for a new piece. The Wolves need to get the best deal, and they have targeted Josh Richardson from Miami as the player they need. The Wolves had an interesting draft even if Okogie may have been a reach in the first round. Yet, Bates-Diop has shown the ability to be an efficient combo forward who can shoot from outside. Towns and Wiggins need to step up as they have not made the team win when Butler was not there.